I delivered my son with my own hands. Our midwife was on the road somewhere between northern Detroit and Flint. This is the story of that miraculous day. “This is just such a sweet, sweet baby.” I said to my husband not too many months before baby’s birth. “It’s just so very sweet. Already. Right now.” How could I put to words my sense of this baby’s character? How could I know already? It was active yet gentle. So very strong but calm. Easy to carry; a comfortable pregnancy. Just a kind-hearted, sweet little person growing inside me. What better word was there besides sweet? Flint was hit by a winter storm on Sunday. We were out in it; we were not deterred by the inches and inches of snow predicted. I was a day shy of 39 weeks pregnant, but who cared? We couldn’t miss the Christmas cantata or Juniper’s birthday dinner at my parents’ or First Presbyterian’s Feast of Carols downtown… it’s a Christmas tradition! We had to go. We did. My in-laws were in town; we’d had a family Christmas party the night before. Sunday was a full, beautiful, white, busy, headache-inducing day (headache caused by driving through the driving snow). But my Juniper was six! Six! Already! And I still had two weeks to relax before I expected baby… because of course I would carry this baby past his or her due date like my other babies… Right? Right? Snow-loving girls in their element. Monday morning came and I was awake at 4:30 a.m. with mild contractions anywhere from fifteen to twenty-five minutes apart. False labor, I said. False labor, my body said when contractions completely went away after I got out of bed at six a.m. and started cleaning the house from the chaotic weekend. Well, it might be tonight or it might be tomorrow and it still might be Christmas day, I told myself. I sat down to do my Bible study and was accompanied by a few contractions, too mild to matter. My girls woke up, we cuddled in bed for a while as we do every morning, then went downstairs for breakfast. My in-laws stopped by on their way out of town, delivering an awesome, nutritious crepe breakfast that was certainly welcome! I noted a few more contractions, maybe three or four an hour, but they were seriously mild. I sent a text to my midwife Goldie anyway, telling her I’d let her know if things sped up or slowed down as the morning progressed. Contractions didn’t speed up, but after breakfast I sure did. I put the house to rights, cleaned the kitchen and bathroom (including the tub, which is a big deal at 39 weeks pregnant), and took a shower. My contractions slowed down to nil: “too insignificant to clock.” Or maybe I was too busy to clock them? By this time it was noon. Now this wasn’t my first rodeo; it was my third, actually. I knew how contractions worked. I thought if I sat down to rest for an hour, things would change. Labor would pick up and I’d know it was time to set up for the home birth. Or labor would go away completely, in which case I could go about my day as normal. If you’ve been with me through my other labor and deliveries, you may see a pattern at this point (a pattern I certainly wasn’t seeing). I’m not sure if it’s a mental mechanism I’ve created to help myself experience the highs and lows of labor or if I’m just a really silly person (or both), but I’m always in denial about labor. For Juniper, I was convinced at 8 a.m. on Friday that I’d be laboring for the entire weekend. I had her not twelve hours later. For Starling, I wanted to send my midwife and her assistant away to get themselves lunch at 1 p.m. Starling was born at 2:32 p.m. I have a bad(?) habit of not realizing I’m in labor. That said, when I sat down on the couch at noon to rest and knit for an hour, I had NO contractions. Okay, maybe one. You should also know I’ve NEVER been able to knit during labor. EVER. I’ve tried twice! This time, I knitted for a solid hour. What was going on? My labor had certainly petered out when I’d expected it to pick up and regulate once I relaxed. Ugh. This was a fickle labor and a strange one. “Goldie, I don’t know what to think about this labor!” I wrote her. “When contractions are 10 minutes apart, let me know.” she wrote back. Okay. Fine. I could do that. I was in contact with my neighbor and friend Shannon and I let her know that at this point, bummer, contractions had gone away and it probably wouldn’t happen anytime soon. I also told Ryan to stay at work. It was one o’clock in the afternoon by now and I’d not given the girls lunch. I gave them each a banana (not our typical lunch for sure) and had one for myself. I warmed up a mug of bone broth. I had a few intense contractions in the kitchen and I knew at that point I didn’t want to be alone, just me and my little girls… in case a baby all of a sudden came out? So I sent Ryan a text and he was home by 1:30 p.m.
Now you must understand I still thought this was false labor because it wasn’t regular and many contractions were so very mild. I wasn’t clocking the ones I couldn’t feel. So Ryan and I planned our afternoon. He’d get a loaf of bread started in the bread-maker (because I like the smell of bread baking during labor) then go outside to chop firewood for our wood-burning stove, enough to get us through the next few days. Sounds like a good plan, yes? Absolutely logical. Except then, while I was braiding and pig-tailing my daughters’ hair, I felt contractions becoming more frequent. Never regular, mind you. But certainly more frequent. They were coming four, six, eight, three minutes apart and lasting sixty seconds to two minutes. What?! I sent Goldie another text and her response: “Leaving now.” I asked Shannon to come over and help me set up for the home birth while Ryan was outside chopping wood. I also wanted to vacuum the entire house real quickly. She said she could come over right then. Perfect. Juniper wanted to know why I was braiding her hair in the middle of the day. “What?! You’re having the baby today? !” She was almost too excited to stay still for me finish the second braid. Then I told Ryan that Shannon was on her way over. I abandoned all attempts at anything in the kitchen, thinking only that I needed to find a good place to BIRTH THIS CHILD. Should I try going back upstairs to the bathtub? Where should I go?! But my excellent team of two had the pool inflated before I could make it past my rocker/glider (aka, my second favorite place to labor, come to find out) in the living room. They stopped filling the pool (it had just a little bit of water in it at this point), put the liner in then filled it up with all the hot water in the hot-water heater. My words were very few, very well-chosen and direct and loud and I was in hard labor so I wasn’t totally polite. Ryan said later that he knew things were getting serious when I stopped using full sentences and just responded to questions with one or two short words. I remember that, too. While I buried my head in the seat of the glider, he started running up and down the stairs with buckets of cold water from the bathtub (our only bathroom is upstairs because we live in a quirky old house) and when the temperature was good, I got in. As twice before, the warm water was such a relief, such a comfort. I loved it. Shannon brought my blessingway flowers into the room, a visual reminder of friends praying for me. She lit candles on the mantle. Between contractions I asked her and Juniper to take one last picture of my freshly-hennaed belly that I’d enjoyed for all of three days. Juniper had her camera and when the batteries died, Ryan gave her his. She took pictures and video from her priceless, six-year-old perspective that I will always cherish. Meanwhile Starling, my three-and-a -half-year-old, was standing on the other side of the birth pool wall, directly in front of me. She was totally focused on the process and singing the “birth song” right along with me, just like her big sister did the day Starling was born. What a champion labor supporter! She learned from the best, after all. God certainly heard my call, because He gave me extra peace and extra strength that day. 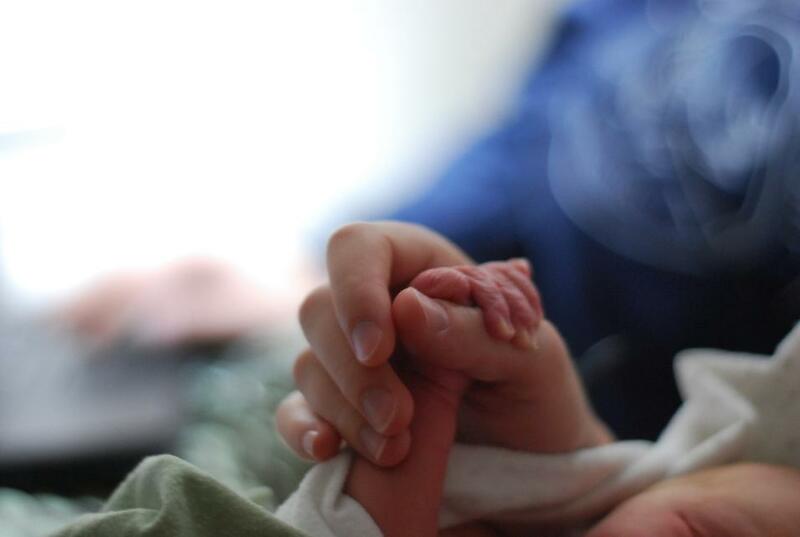 He watched over an unassisted home birth and saw that there were no complications. On top of that, He gave us a beautiful, healthy, happy baby boy! I pulled the baby up out of the water and against my own body. He was a boy, no mistake about that! A handsome little guy! He squawked and squawked but soon calmed down, absorbed in looking around. I rubbed his back. His color came quickly. Ryan called Goldie and said, “Janie’s in the birth pool holding a baby boy.” She was still on her way and told us to relax and enjoy those first moments. Which is exactly what we did. To pass time, Ryan got out his guitar and we sang Christmas carols, What Child is This? !, among others. Starling asked why he was covered in butter. She also took up the job of bringing me drink after drink of labor-ade, that little doula. Shannon, meanwhile, took some phenomenal birth pictures and truly precious first family-of-five pictures. My contractions kicked in again and I gave baby to Ryan to hold close to me while I got back up on my hands and knees to birth the placenta. We all chanted “Me No Like this Placenta! !” because that helps placentas come out. When Goldie came, she found a happy sleeping, nursing baby in his mother’s arms, surrounded by warm water. She also found a tired mama who was more than ready to get out of the pool. Two excited little girls in matching pajamas. A proud father ready to continue assisting in any and every way. A helpful and upbeat friend who had the best record and play-by-play of events because of the great pictures she’d taken. We got out of the tub. I made a few important phone calls, one to my mom and one to my sister-in-law. We sat as a family on the couch and basked in the new baby glow, enjoying the warmth of the nearby fire. Ryan called his folks and his brother. Ryan’s bread finished baking, my parents came over to meet the little man and Goldie cleaned up the birth pool. We were so grateful for her presence there, to cauterize the cord then examine the baby (7 pounds, 7 ounces, 20.5 inches long). She helped baby and me take a lovely healing herbal bath upstairs. She practically tucked us in bed for the night. It was a crazy-beautiful day. Goldie cauterizing the cord with Starling’s help. Juniper’s turn to help, with my mom nearby. Each and every day God has my family in His hands. I’m so grateful that in His wisdom He gave me an extra measure of strength and peace on this particular snowy Monday in December. He brought my son into this world, healthy and whole. I was able to be a true instrument, a literal vessel of another precious miracle. I’m still so geeked about that as I type this story one month later. I remember a dream I had toward the beginning of this pregnancy: it was the middle of the night, the Christmas tree was lit but everything else was dark and I delivered my own baby on the couch, all alone. This dream didn’t scare me in the slightest. I had a deep desire to deliver my own baby all along (although not necessarily without a midwife present). The memory of this vivid dream was with me when the situation became a reality. Yes, it was the middle of the day (2:44 p.m. to be exact, one hour after hard labor kicked in). I had a dear friend, my amazing husband and two exuberant daughters with me but otherwise we were alone. Alone but of course, not alone. Never alone. We named him Goshen Marcus. Goshen means safe haven, a place to draw near to God, a promise of provision. Marcus is the name of the gentleman who led Goshen’s great-grandpa to Christ and is both Ryan and Ryan’s father’s middle names. Our little man has russet velveteen hair, curiosity in his eyes and the sweetest disposition, you wouldn’t believe. I’m so blessed to be chosen to be his mother. There is nothing like getting to know a completely new little person. He is just as calm and sweet as he was while growing inside me. Welcome to the world, Goshen. You are loved by your big sisters and by a tight network of supportive friends and family, here and around the globe. You are so loved, SO LOVED, by your mama and papa but most of all, you are loved and cherished by your Creator. May your walk in this world be full of light. May you always find yourself a stranger in a foreign land, walking and working toward Home. End of the birth story and beginning of so much more.